New Star Wars Land Concept Art and exciting new details about the Star Wars-themed lands planned for the Disneyland® and Walt Disney World® Resorts were shared on the “Wonderful World of Disney: Disneyland 60” special that recently aired on ABC. Walt Disney Imagineering has joined forces with the imagination of Lucasfilm to bring this galaxy to life, and the illustrations shared during the TV special show the epic scale of these lands. You will be able to step aboard The Millennium Falcon and actually pilot the fastest hunk of junk in the galaxy, steering the vessel through space, firing the laser cannons, in complete control of the experience. Stay tuned for more details about all the excitement coming to Disney Parks, the place where Star Wars lives. I was as excited as any Star Wars fan would be when Star Wars Land was announced at the D23 Expo last August. Of course, I still have many questions. How long will it take until we are able to experience this for ourselves? (I have a feeling it is going to be later rather than sooner.) What is going to happen with Disney’s Hollywood Studios while a good portion of the park is closed for construction on the new Star Wars areas? 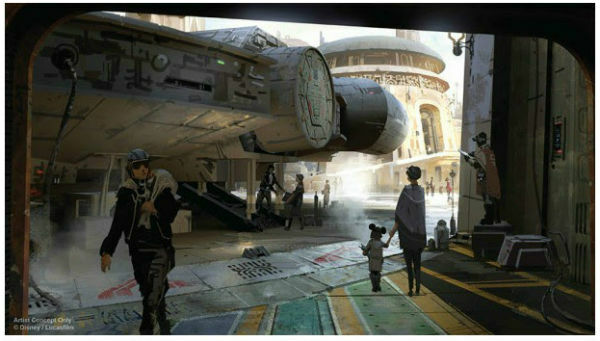 Regardless of the answers, this new Star Wars Land Concept Art is really great and I am very much looking forward to Imagineering making it all a reality. I trust they have the talent and desire to make this experience amazing! This entry was posted on February 23, 2016 at 8:30 am and is filed under Disney News, Disneyland, Hollywood Studios, Theme Parks, Walt Disney World. You can follow any responses to this entry through the RSS 2.0 feed. You can leave a response or trackback from your own site.